Can this recession propel you into a passion-based career? 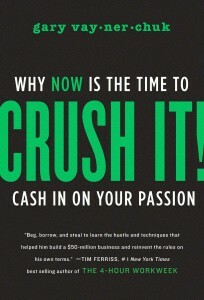 Marsha Sinetar wrote a brilliantly-titled book, "Do What You Love The Money Will Follow." Joseph Campbell said "Follow your bliss." Gary Vaynerchuk, author of Crush It says, "If you live your passion and work the social networking tools to the max, opportunities to monetize will present themselves." The perennial idea of turning your passion into a vocation has had mixed results. The good should be obvious-- people following their bliss pursue careers which have personal meaning, which enhance and support their life, and which complete them in a fulfilling way. The downside is that the "follow your bliss" mantra can be blindly and mindlessly followed and used as an excuse for self-destructive, narcissistic behavior. People pursue unrealistic dreams without thinking through the practical aspects or consequences ("Balloon Boy" anyone?). But it doesn't have to be this way. It is possible to follow your bliss and create a fulfilling life (particularly since work is only one part of that life), and be successful-- if you're smart and are willing to do the work that is necessary. I've written several posts on developing your brand. When I wrote the proposal for my book, "You Majored in What?" I was asked continuously about my "platform." Put simply: a platform is who knows you and who will buy your book. And publishers don't really care about the 300 people you connect to: they are interested in numbers in the thousands. This was hard for me-- as a happy natural introvert, I really wasn't comfortable traditional sales and marketing. Some of you may find yourselves in that same boat: you'd like to start a business but you're not all that comfortable with the sales/marketing angle. And perhaps the cost of doing a traditional advertising campaign has kept you from starting a business. Savvy use of social media might just be your answer. I stumbled on "Crush It" through a blog post by one of my favorite "writers who write about writing", Christina Katz, whose book Get Known Before the Book Deal I highly recommend to any writer hoping to get published. I trust Christina's judgment-- so I took a chance and bought "Crush It." And while reading it (in one evening-- it's a quick read) an image crossed my mind. In one of my favorite Steve Martin movies, My Blue Heaven, Martin plays a likable hustler-type character who decides to write a book while sitting on a plane (reading a book aptly titled, "I Wrote a Book.You Can Too."). "I tip everybody. That's my philosophy. See it's not tipping I believe in-- it's over-tipping. I think this is the kind of thing people would like to know," he states to a fellow passenger as he tips a stewardess, and then quickly writes down his idea. No pretentions-- just ideas, and a desire to help others. Something about Vaynerchuk's book is reminiscent of that scene: an average guy writing a book that is plain-spoken and down-to-earth. To paraphrase the book Steve Martin was reading, Vaynerchuk essentially says "I Created a Million-dollar Business Through Social Marketing. You Can Too." But while the Martin character is pure tongue-in-cheek, Vaynerchuk's book is full of valuable advice presented in a down-to-earth style. It is easy to read and absorb the information. He is blunt, honest, and somehow at once self-aggrandizing while self-effacing. He comes across as likeable, enthusiastic, and energetic. At one point he writes, "I'm going to make a lot of massive, bold statements in this book, but let me assure you that I'm not trying to be a shock jock. I wouldn't say anything unless I thought long and hard about it." "It's never a bad time to start a business unless you're starting a mediocre business." "The messages in this book are timeless. Do what makes you happy. Keep it simple. Do the research. Work hard. Look ahead." "What if you don't have a hard business instinct? Don't worry; skills are cheap, passion is priceless." This is first and foremost a marketing book-- he will not tell you how to handle budgeting, taxes, or many other areas of managing a business. What he will tell you is how to channel your passion into an entrepreneurial venture, how to advertise for little or no money, how to build a personal brand, and the importance of working aggressively and tirelessly-- a message that is often left out of the usual "follow your passion" mantras. He also is very realistic about the amount of money you will make-- this is not a "get rich quick" scheme or a promise of a million-dollar career. In fact, he admits that most people will not make a six-figure income from their entrepreneurial endeavors-- but he's quick to point out that many folks would rather earn $60,000 working for themselves following their passion than working for the same amount at their current job. I recommend you read through it once for the overall wisdom, and then read it again to get the details and action steps you need to take. "Crush It" cuts through the clutter. I particularly like the way he distills his key points into a one-page to-do list of getting started in social media. He is brutally honest about the amount of work it will take-- telling the reader that they will have to spend hours each day. He is the ultimate believer in self-accountability: you are totally responsible for the time you invest in your venture and if it doesn't succeed, he will tell you that it's probably your fault. Many people have this vague dream floating about in their head; the business they would start, the book they would write, the passion they would follow. Sometimes when life has given you a kick-- like a recession, a layoff or a stalled career with no raises or bonuses-- it can be the perfect time to try out one of those ideas. "Crush it" can help you get started.